I unabashedly give this book a full 5 stars!!! Its the third in a trilogy but the whole series is absolutely great! The characters come to life right off the page. I couldn't put it down! Filled with the magic and mystery that makes science fiction so awesome, Karina’s Mind Over All takes you from Earth right down into another planet. Deryl, the main character, is a psychic with abilities he doesn’t quite know how to use yet who has been enlisted to help save two worlds from certain destruction. In the meantime he tries to help his friend work out his problems with his fiance. I LOVE these books! They will certainly keep you on the edge of your seat! I'd recommend this book to anyone looking for an awesome science fiction adventure! I can't WAIT to read the Hearts Over Mind novella next! At long last, Deryl has it all. He’s mastered his psychic abilities, escaped the asylum on Earth where he was being studied, and thwarted the alien Master who would have forged him into a weapon. He has gained a new home among the psychics of Kanaan and, with the coming birth of his son, a family as well. But darkness still looms, as the enemy prepares to invade Deryl’s new homeworld. 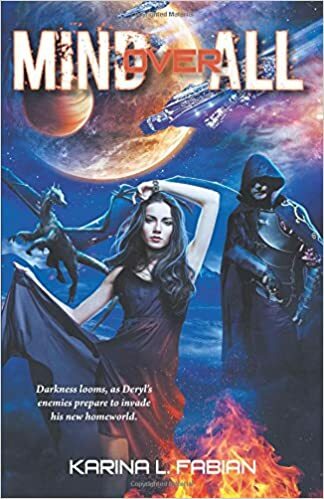 With planets set to collide, Deryl will have to accept his role as savior of both worlds, and push his mind’s powers to the limit in order to save those he loves.